Introducing our puppies from Polarbear Queen Kylie and Northernwhites Luka which will be available to selected clients beginning January 15, 2019. Scroll through this page to read about the parents of these puppies and the pedigree of this litter. These puppies are currently being tested for intelligence and temperament and test results will be available by January 8, 2019. Each puppy will have a rating as a “Pick Litter” or a “Standard” quality puppy and will be identified as such in their puppy description as soon as our results are in. Polarbear's Queen Kylie is pure Polarbear! She is the daughter of prized parents, Polarbear's Queen Qali and Blacknights Icy Hail and great granddaughter of our foundation male and female, Shack Von Hammer and Sheba, featured on our homepage. Kylie is incredibly intelligent, very intuitive with Polarbear characteristic people skills, and she has an arctic white short coat and jet black pigment. The combination of Kylie and Luka is sure to be outstanding and we are looking forward to hearing about what their new owners have to say! 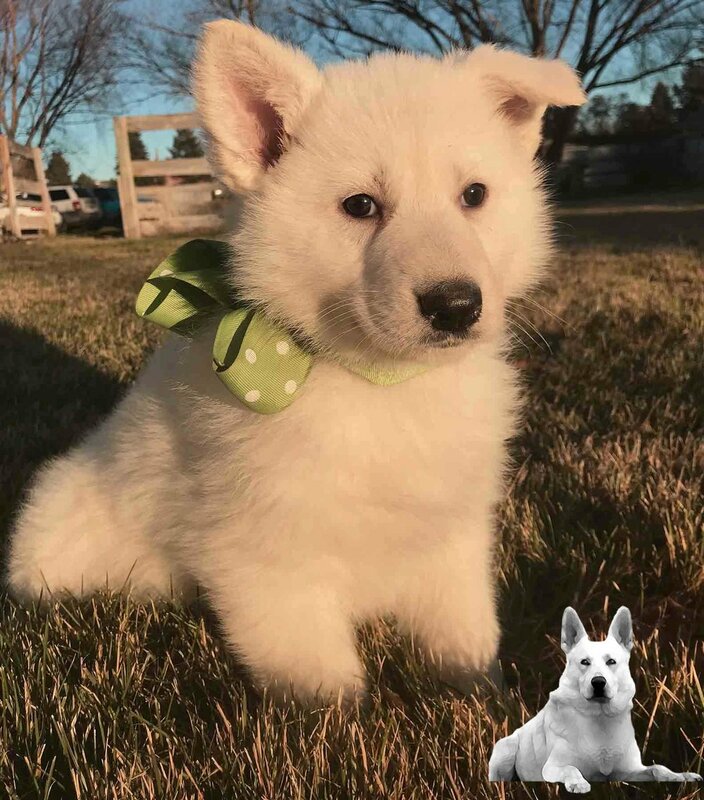 Northernwhites Luka "Luka" is King of the North here at Polarbear White Shepherds. At six (6) years of age, Luka is a gentle giant with a loving, affectionate and playful personality. He loves his toys and interacting with our family. Luka has a beautiful quality medium length arctic white coat and an athletic and solid build.